How to photograph the milky way in 5 easy steps? 1) No clouds or moon. Make sure the weather is clear and there is no full moon. New moon nights are the best. Clouds will block your view completely and you will not be able to see any part of the Milky Way. Make sure you check the weather forecast before heading out. 2) No city light pollution. As Milky way is a faint band consisting of various gases, stars and other astronomical matter, it is extremely difficult to see it among the city lights. 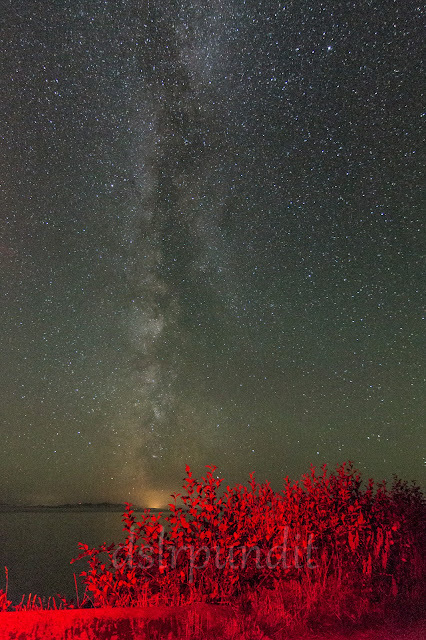 In order to photograph the milky way, we need light pollution free sky. To find a nearby dark sky area, a good website is the dark site finder world lightmap. Zoom into your area and find the nearest possible green/blue/grey zone area. Make sure the spot you have decided in these dark zone areas is safe too, safety comes first. DO NOT venture out to a completely new area in the dark by yourself. 3) Locate the Milky Way. Once you are out on a clear night and at a dark location, next step would be to locate the Milky Way. In my previous post, I explained everything about locating the Milky Way. Always remember the constellation Sagittarius and summer months. Once you have located the Milky Way start setting up your gear. Connect an ultra wide angle or wide angle DSLR lens to your camera and mount the whole thing on a sturdy tripod. 4) Set up the camera to infinity focus. Switch to manual focus and take a few shots of any distant light source. Read my previous post for better examples to set infinity focus properly. Once you think you have set the correct infinity focus, take a few test shot of stars at let's say 1600 ISO, F2.8 or F3.5 (whichever is lowest possible) and 12 seconds. Zoom into the photo taken to see star focus and readjust if needed. 5) Set appropriate shutter speed to avoid star trails. This depends a lot on your camera type and focal length. Ultra wide-angle focal length range is best for Milky Way photography. Follow the 500 rule or even the 400 rule to avoid star trails. I have linked my previous post for more information just in case you do not understand what I am talking about. Once you have determined the shutter speed, set your camera to delay mode to avoid possible shakes and vibrations caused by your touch. Delay mode basically means your camera will activate the shutter (start to take a photo) after the specified time such as 2 seconds or 10 seconds. That's all. This is how Milky Way shots are made. Once you get some experience, try playing with compositional techniques like having something in the foreground. If you don't know anything about composition yet, keep practising your Milky Way photography skills. You make it sound so easy!! Great post with very helpful tips!